Posted Thursday, August 13th, 2015 by Greg Gladman. Like it or not, all employees will spend a bit of time doing things we’d rather not talk about. One thing that cannot be avoided is restroom breaks. This is one area where it’s best to just go with the flow, pun intended. Make it a welcoming place to get the job done. It’s time for a bit of work in—ahem—the bathroom. One way to keep employees happy is to provide all the essential hygiene items. Of course you need toilet paper and hand-washing soap. But why not go the extra mile and provide staff with additional items like cotton swabs, lotion, and essential oils? 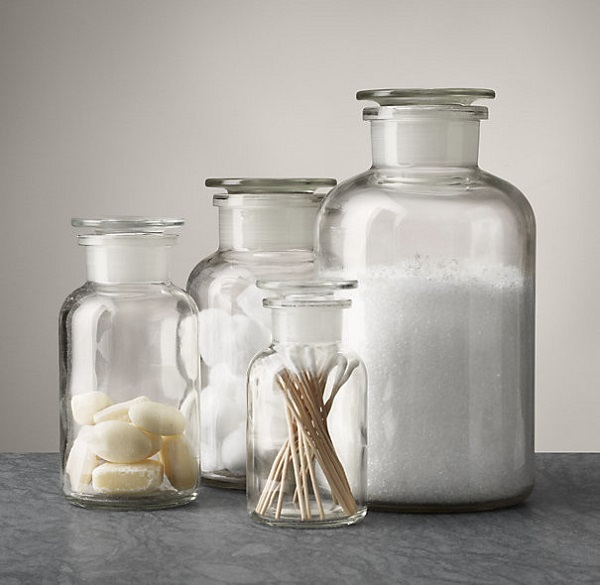 You can display items in pretty glass bottles with printable labels so employees have a visual reminder of all the extras available to them. Posted Thursday, August 6th, 2015 by Robyn Warner. It’s good to be green! At least, it’s good to be a business that acts responsibly when it comes to the environment. This means taking steps at the office to reduce waste and increase efficiency. This blog will help you to make your office a greener space that you can feel proud of. Businesses rely on communication to help get the job done. This adds up to lots of memos, invoices, and other methods of passing around information using paper products. If you’re not recycling already, it’s time to get started! Many cities offer shredding services for confidential documents that you no longer need. You can set up your own recycling box for everything else. Encourage employees to use both sides of paper whenever possible. You can also ask them to toss waste into the office recycling bin when they are done, not a trash can! 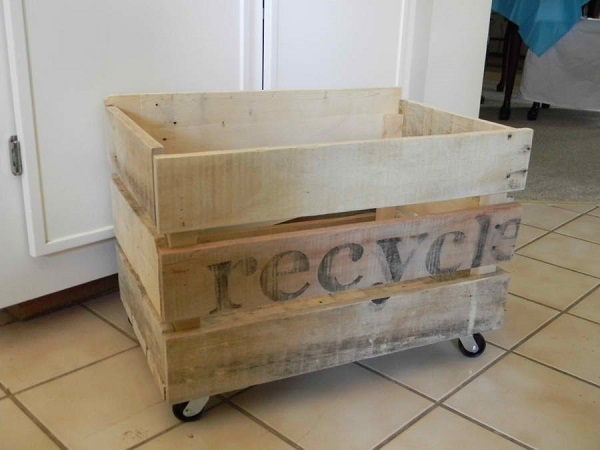 Make your own recycling bin out of crates and start cutting back on paper. Posted Thursday, July 16th, 2015 by Greg Gladman. Evidently, Karl Lagerfeld stunned audiences at Paris Fashion week when he unveiled a 3D-printed version of the classic Chanel suit. 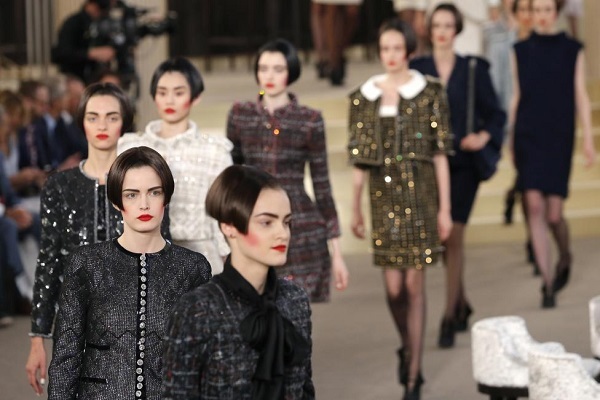 The head designer for Chanel has never been one to shy away from risks, and with this type of venturesome spirit as inspiration, this blog will focus on 3D-printed clothing you can wear to the office. Posted Thursday, June 25th, 2015 by Robyn Warner. Get out of the dark ages! We’re not talking about ancient history. We’re referring to illumination. Brilliance. Radiance. When designing your office space, don’t neglect what is arguably one of the most important aspects: good lighting. If people can’t see what they’re doing, your business is sure to take a hit. This blog will provide simple tips to light up your life at work. There are many ways to address the issue of good lighting, and if you’re lucky enough to have natural options available to you, why not take advantage? In fact, studies have shown that employees who are exposed to natural light in the office sleep better at night, have more physical activity, and report better quality of life. If you want DIY options on window treatments, this site has a lot to offer. Posted Thursday, May 14th, 2015 by Greg Gladman. Spring has finally sprung! If you’re like many employees, you‘re probably spending a fair amount of time gazing through the window, wishing you were outside. Instead of wasting all that time staring out doors, you can make yourself, your boss, or even your co-workers a lot happier if you can find ways to bring the outdoors in. This blog is about designing an outdoor-friendly office space. First of all, it’s important to know a bit about the benefits of the great outdoors, in case you have any “obstacles” in your way. Plants are the foundation of most of the food webs on Earth. This means that you can start with essentially any animal and work through a food chain, all the way down to plants. For example, a lion eats a zebra which eats grass. In short, without plants, none of us would be here! For the office, a simple argument boils down to the quality of the indoor air. 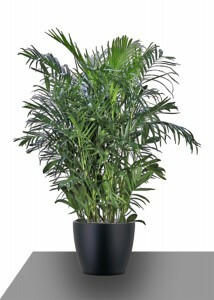 Houseplants are pretty to look at, but they have also been shown to actually help purify the air we breathe! Considering that indoor air can be up to five times worse than the air outdoors, this makes indoor plants a necessity at the workplace. These top 10 plants are effective at removing formaldehyde, benzene, and carbon monoxide. Posted Thursday, April 9th, 2015 by Greg Gladman. More and more people are following their dreams, taking a risk, and starting their own business. If you’re among this daring bunch of entrepreneurs, you might be starting your business venture from the comfort of your own home. Whatever your reasons for staying on the home front, chances are you’re short on space. This blog will discuss the best way to create office spaces in small places. 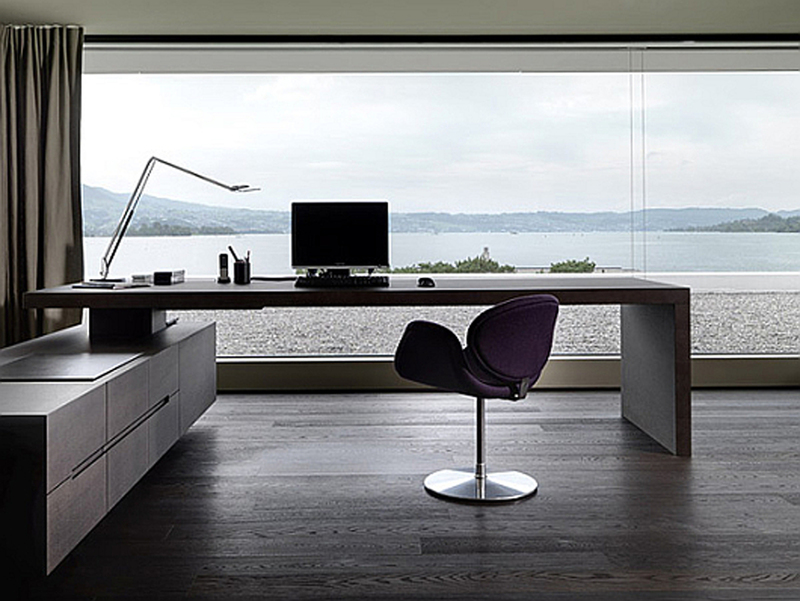 The first step toward making a home office is to take a thorough inventory. Do you have a lot of files? Are you plugged into a lot of technology? How about supplies? Exactly how much space you’ll need is determined by the amount of stuff you require to keep your business flowing. If you don’t have loads of stuff, and are equally short on space, you can create a workspace in all sorts of unexpected spaces. 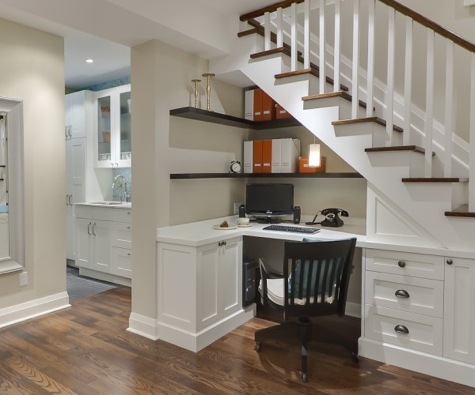 Even working from under the stairs can be perfectly fine if you’re able to piece together an area that meets your needs! Posted Thursday, February 19th, 2015 by Greg Gladman. If you have an office, you might have spent hours picking out paint for the walls, thumbed through countless magazines in search of the perfect chair, and then devoted even more time to picking out the finest accessories that would help make the best statement about you. All this is certainly important, but how much effort went into the break room? Perhaps the most underrated and neglected part of any office is the employee break room. If you think of this area as just a place to top off a cup of coffee and grab a doughnut, you and your co-workers are really missing out. Break rooms can be a mecca for creativity, chivalry, and even productivity if you set them up right. 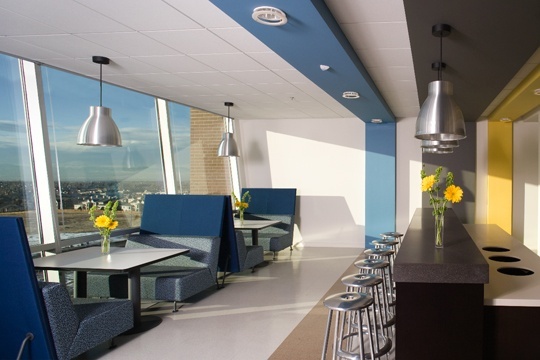 Given that colors can impact mood in big ways, the color of the break room is majorly important. For example, red can increase your heart rate and breathing, and is typically used as an accent color. Green is a good way to bring in the outdoors and induce relaxation. 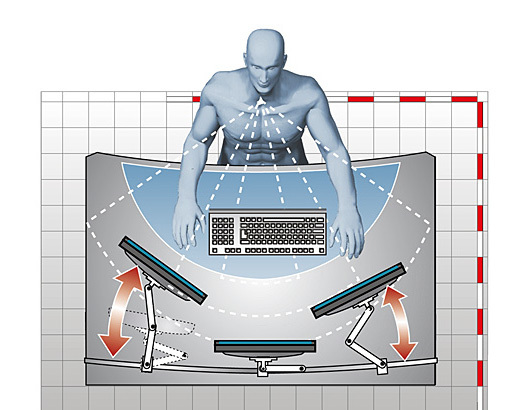 Blue symbolizes loyalty, so it is no surprise people tend to be more productive in blue rooms. This site has more information on different colors and how they may impact your break room. Posted Thursday, November 27th, 2014 by Greg Gladman. When Monday rolls around and it’s time to head for work, do you find yourself fighting the urge to call in sick? 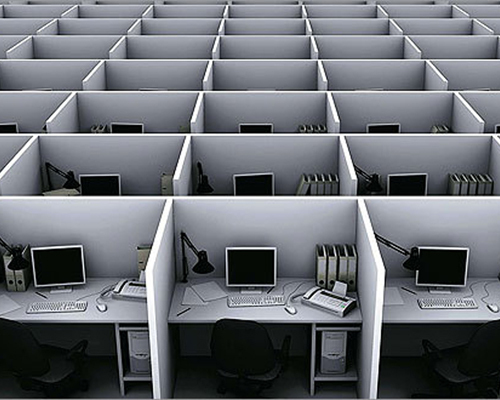 Are you working in a “cookie cutter” office space that leaves you uninspired? Try personalizing your space to make work life less ho-hum and more exciting! We have some suggestions for you.